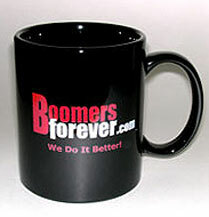 A stylish black or white ceramic high gloss interior and exterior coffee mug. Exclusive Boomersforever design on both sides. Red and white text on black mug or red and black text on white mug. We Do It Better Mug!